I'll say this, no one ever worries about getting a Christmas present wrapped in birthday paper. 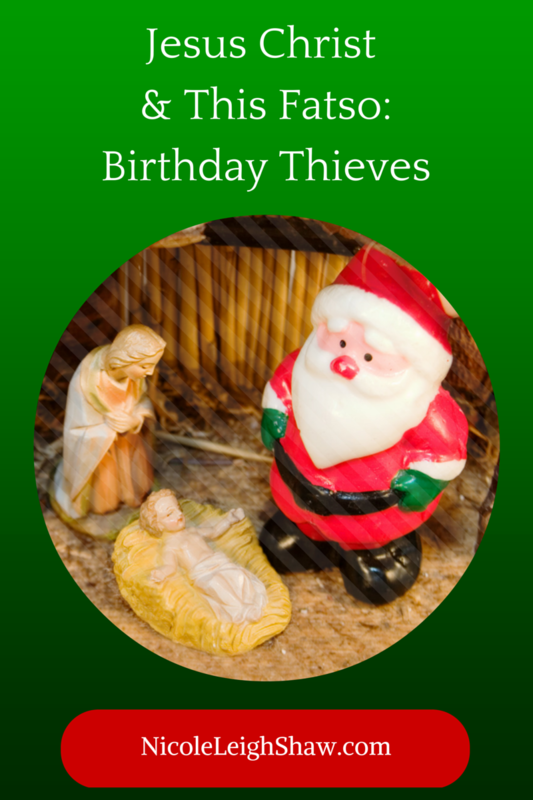 Like many December babies I worry that my birthday is marginalized by Christ's birthday. I put on a brave face, but for a guy who was all about humility, he sure makes a big deal about his birthday. That is, his followers do, all 2 billion plus of them who claim Jesus is "The Reason for the Season." I know they claim this because their status updates and bumper stickers say so. You know, those bumper stickers you see on cars parked at the mall while their drivers are inside doing God's work: shopping for a $10-or-less ornament for the office exchange. Holier-than-thou, "Reason for the Season" folks proclaim it righteously during passive-aggressive cookie exchanges. "Well, people best remember that Jesus is the reason for the season. Just like Sue Jones best remember that she's not the only person with an old family recipe for peppermint melt-aways. We'll just see whose cookies get the most takers, now won't we?" I'm a Christian. I get it. December belongs to a very special person. A person whose entire mythology resonates with themes like joy, selfless giving, maintaining a kind nature, supernatural powers, and cookies with milk. It's also about Jesus. I dig Christ. His unwavering dedication to shaking up the old mores and up-ending the establishment is, like, totally awesome. However, in a month where I have to share my birthday with a morbidly obese man who can perform magic, it would be nice if the world's most famous hippie could celebrate his birthday somewhere in the vicinity of his factual birth. It's only fair. I stick with my original birthday as verified by the state of Florida on my birth certificate. I don't have a multi-national religious machine who is able to move my celebration day around so it can subsume pagan festivals with Christian doctrine. December 19, 1976, for better or worse, that's my day. Jesus, according to biblical scholars like this cat, was more likely born in September than December, making him "The Reason for the Labor Season." In other words, thanks for ruining my birthday, Jesus Christ. Except, I can't say my birthday has ever been ruined by it's proximity to Christmas or the celebration of the Savior's birth. I've never gotten a gift intended to cover both events. A Chrismirthday gift. Nor has anyone confused me with the coming of the Lord incarnate and brought me myrrh. I sometimes wonder if my December birthday is the reason I've never had blowout parties, a fact I've always attributed to everyone's being too busy with holiday obligations to attend my pinata-centric fete. (We have Chex Mix! Still no?) Then again, I don't know that anyone has a major social event every time it's her birthday. In fact, I have no idea what goes on during the other months. Are July babies full of school's-out-for-summer angst? Do October babies compete with masked children more interested in the next opportunity for costumed beggary than singing the birthday song? I'll never know. I'm a December baby. I often accept my birthday gifts at the same time that I'm handing over a Christmas present. It's probably not so different than having a birthday during any other month. Except that during my month, when people see me coming, they are reminded of one more damn present they need to buy during the most spendiest time of the year. While you're here: BUY SOME FUNNY STUFF. It doesn't have to be for my birthday, but it doesn't not have to be, either.